Self-catering groups can eat outdoors in the east terrace or indoors in the large dining room the professional kitchen is next to both facilities. Note: Self-catering groups can also use our B&B services i.e. we provide breakfasts and evening dinners during all or part of the stay. See the «Large Groups» page. Note: We can also host family receptions like weddings and other large gatherings seating up to 280 people. This does not have to include sleeping accommodation. See the «Receptions» page. The château was formally a hotel and thus is extremely well appointed to comfortably accommodate small and large groups of people. 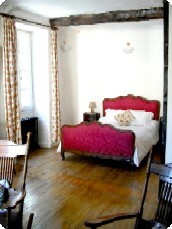 A party can take any number and combination of these rooms/suites/gite and the price will vary accordingly. A group will only pay for what it uses. 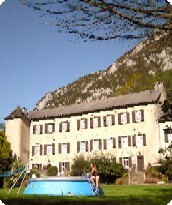 For a self-catering party of about 10 the kitchen areas in the gites should be sufficient as a self-catering base. Self-catering parties larger than 10 would be more comfortable renting the professional kitchen and dining room, which used to be a famous restaurant, on the ground floor. A large party could rent, not just the dining room and kitchen, but the whole or parts of the ground floor with all its enormous function rooms This is the dance/seminar room, grand bar, and grand salon. These rooms are normally used by groups with large indoor space requirements for group activities. For example exercise/healing sessions, company seminars, courses, meetings, conventions and all kinds of indoor events. 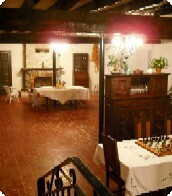 The function rooms can also be used if the weather is not good outside. Please use the «➔ Prices and bookings» facility to find immediately the exact price for the requirements of your group. Groups can relax in the large private gardens . . . perfect for enjoyable fun holidays.